A maquette is a fine art term and refers to a small mock-up of a fully realized three-dimensional sculpture or architectural project. The word is French for "scale model." Its use in English is somewhat outdated, but artists and architects may use the word to differentiate from other kinds of "models" such as a person who poses for a portrait. 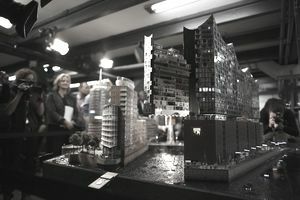 Maquettes are often used for competitions and exhibitions as well when building a full-scale model is impractical or impossible. And it's not just sculptors who use them as display tools; maquettes are also built by architecture students, as they try to depict their projects pre-construction. There are several museums that have collections of maquettes, including the Museo dei Bozzetti in Italy. For instance, when viewed together, the maquettes of Chadwick's Inner Eye, a massive iron sculpture more than six feet tall, show the evolution of the piece over time, as Chadwick added new elements to each one. At least one of these maquettes was in the private collection of Nelson Rockefeller.